Modern lemurs, their name means ghost, are survivors of a process of adaptive radiation that began some 50 million years ago when the ancestral lemur became isolated on the island of Madagascar. Today 22 species in 12 genera are all that remain. We have two examples of the four families of lemurs found on Madagascar, the family Lemuridae and the family Daubentonidae. We have no specimens of dwarf or mouse lemurs (family Cheirogaleidae) or indris (family Indriidae). Lemurs (10 species, 4 genera) are squirrel to cat-sized mammals with black-pointed muzzles with sensitive whiskers and naked moist noses. Lemurs have the typically primate traits of forward looking eyes and binocular vision. Males and females tend to be similar in size but differ in coat colour. Different lemur species have coats of different colours and patterns. Lemurs are typically quadripedal climbing on all four feet along branches among the tree crowns. They move from tree to tree by leaping. Their hind limbs are longer than their fore limbs and they have long bushy tails which are longer than their bodies. Lemurs are mostly arboreal but their life styles and habitats are variable: some are nocturnal, some are diurnal. They live in multi-male, multi-female groups which in most species lack an hierarchial structure. Lemurs have the typical strepsirhine dental formula: I2/2; C1/1; P 3/3; M3/3 = 36. They feed directly with their snouts, not hands, on fruit, leaves, flowers and bark. 1. Ruffed lemur (Varieca variegata). The head shows the typical face of a lemur - a black-pointed muzzle and forward facing eyes; the body is covered by woolly fur, the fore limbs are shorter than the hind limbs, the tail is long and bushy. 2. Skeleton of an unidentified species of lemur. The skull shows the typical forward facing orbits, long snouts and tooth combs. 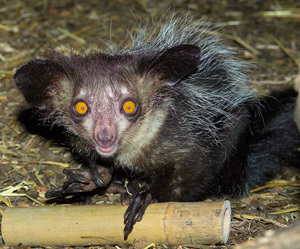 The aye aye, Daubentonia madagascarensis, is the only species in this family and now almost extinct in its home in the Northern sector of the Eastern Coastal forests of Madagascar. The aye aye is the largest nocturnal primate weighing up to 3 kg and measuring up to 80 cm in length from its head to the tip of its tail. Our picture came from the Royal Zoological Society of Scotland (photographed by Alan Thompson) which is one of the zoos with an active breeding programme. Aye ayes are strange looking animals with a white flecked, dark brown coat with long guard hairs and a long bushy tail. They have large forward-staring eyes and large and protruding naked ears like bats. They have claws on all their digits except for the big toe, which is furnished with a nail. Aye ayes are solitary creatures spending their days in a nest and nights moving on all fours through trees and over the ground. Their claws help them to cling to tree trunks including very thin branches and even to hang upside down form the branches. Aye ayes have two unique and extraordinary features that used together make the animals so versatile that they can feed on coconuts and mangoes as well as catch insect larvae tunnelling in wood. First, an aye aye has a pair of large incisors in the upper jaw and a pair of huge incisors in the lower jaw but it lacks canines and only has relatively small cheek teeth: one upper premolar and three upper and three lower molars. Their unique dental formula is I1/1; C0/0; P1/0; M3/3 = 18. Second an aye aye�s fingers are very long and the middle finger on each hand is exceptionally long and thin with a very long claw. When feeding on fruit an aye aye uses its incisors to tear through the hard outer shells of coconuts or scrape through the fibrous fruit of mangoes and its middle finger to extract pulp and juice. When hunting insects, it uses its large ears to locate the sound of insect larvae burrowing in wood, its incisors to rip off the bark near the insect and its long middle finger to probe the hole and extract the prey, then pass it to its mouth. 3. 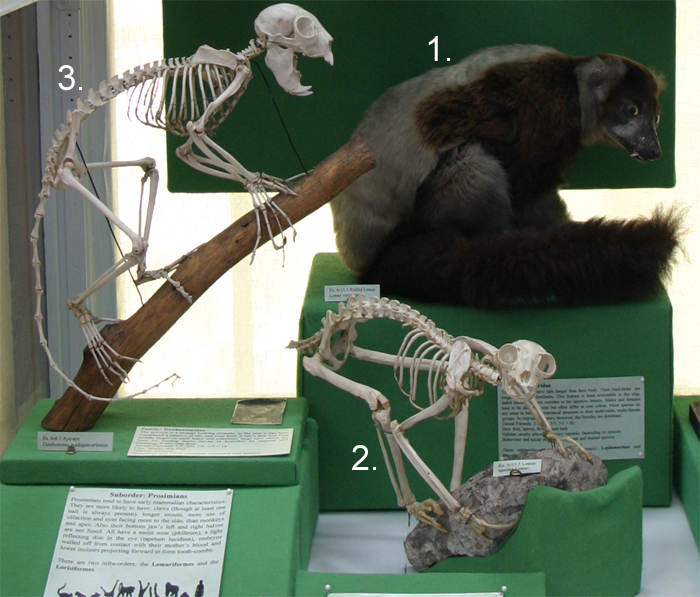 Skeleton of Daubentonia madagascarensis � the aye aye. The skeleton shows the unique features of skull, digits and claws that enable the animal to climb up trees and feed successfully on fruit and burrowing insects.